Suggy’s Gym boxer Fergus Taylor is looking to extend his unbeaten professional record on Friday 14 November when he takes on Ibra Riaz in a Lightweight contest at the Sheffield Ice Centre. The current British Masters Light Welterweight champion, Fergus is up against a more experienced opponent who has never been stopped. But coach Dean Sugden is confident that his strength, fitness and determination will stand him in good stead on the night. “Although many of his fights, including his title win, have been at Light Welterweight, Fergus is massive at Lightweight,” said Dean. “Ibra may have the edge as far as experience is concerned but Fergus has improved with every fight and always listens to and follows the game plan to the letter. 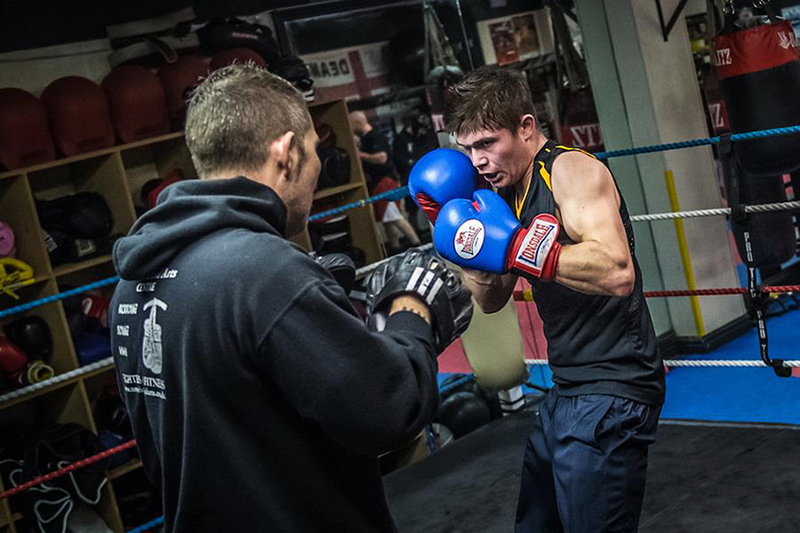 As well as his usual sparring with cousins Chad, Regis and Bailey Sugden, Fergus’s training in the run up to the fight has included working on new things in the gym and additional sparring with big-hitting Ryan Fields. “My last fight, against Lance Sheehan in September, only went to four rounds instead of the scheduled six but it was still a convincing win against a tricky opponent,” said Fergus. “And I was straight back into the gym afterwards so I’ve had plenty of time to get stronger and fitter than ever for this one.